Until the 18th century there was no conflict between sacred and secular music. Composers didn't bother to rework their secular compositions as religious works. Well-known examples are Bach and Handel. The so-called 'Kapitänsmusiken' by Telemann attest to the fact that sacred and secular music can go hand in hand, as they consist of an oratorio with a sacred text and a serenata with a secular text. In order to understand the reasoning behind these compositions it is important to understand the political and social situation in Hamburg. From the Middle Ages Hamburg was an economically important city, especially since it joined the Hanseatic League. Its economic position resulted in many political conflicts, in particular with Denmark with which it was in almost constant rivalry. It also had led to Hamburg being declared an imperial city in 1510. Because of this the city couldn't count on the protection provided by the imperial army and had to organise its own defence. The city founded a civic guard for defence from attacks from outside as well as for deployment in the fighting of natural catastrophes. From 1619 it was a permanent institution. The armed citizens were divided into companies and regiments according to the city's parishes. From 1680 Hamburg was divided into five parishes. Consequently the civic guard consisted of five regiments arranged in 57 companies. In Telemann's time the city had more than 10,000 armed men in the civic guards. Each company was led by a Captain (Kapitän), and the Captains were elected by an electoral college which consisted of the colonel, the lieutenant colonel and the other captains of a particular regiment. As a permanently constituted college they formed a highly regarded institution in the city and were entrusted with various communal duties. By way of thanks for their service to the community the city offered a festive banquet which was held almost every year on the Thursday after St Bartholomew's Day (24 August). It was at these occasions that Kapitänsmusik was performed. Originally each piece consisted of just one part, being performed after the first course of the meal. In 1719 for the first time a composition was performed which was divided into an 'oratorio' and a 'serenata'. It is not known when the two parts were performed. It is assumed the serenata was meant as 'table music'. During Telemann's time in Hamburg 36 such occasions took place. Although it is very likely the celebration didn't take place every year, it must have been held more often than nine times. 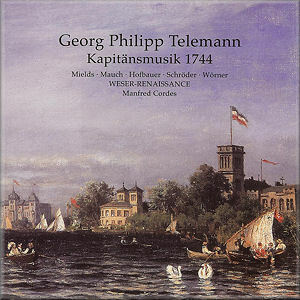 As only nine of Telemann's Kapitänsmusiken have been preserved complete one has to assume a considerable number of his compositions in this genre have been lost. It is not the first time CPO has released recordings of this kind of music. About 15 years ago Michael Schneider with his ensemble La Stagione Frankfurt recorded the Kapitänsmusik of 1755, and some years earlier Wolfgang Helbich recorded the oratorio from the Kapitänsmusik of 1730. These two discs prove that Telemann's music in this genre is of a high standard and deserves to be performed. The Kapitänsmusik of 1724 has been performed in abbreviated form before, but is now recorded for the first time in its original state. The text was written by Johann Philipp Praetorius, a poet about whom not much is known. He also translated the original libretto of Telemann's opera Pimpinone in German. In her programme notes to the recording of the Kapitänsmusik of 1744 Veronika Greuel sums up what the two parts are about. "In their content the two parts had different focal points. There was no real action in the oratorio; instead, the peaceful life of the Hamburg populace in unity and prosperity was presented and spiritually reinforced. The serenata offered a secular look at the city's domestic situation and presented the virtues of an enlightened citizenry." The Kapitänsmusik of 1724 is considerably shorter than that of 1744 as the timings in the tracklist indicate. The oratorio of 1724 begins with a chorus on the words "Rejoice in the Lord, you righteous ones. The pious shall praise him with glory". The soprano sings the praise of the 'Infinite Being, Eternal Light' in her first aria. The next aria expresses the peace the people enjoy with a quotation from Psalm 4: I lie and sleep in perfect peace". In his aria the second bass expresses the thought that even waves and floods can't shatter the confidence of "pious men" - a rather appropriate thought, considering the source of Hamburg's prosperity. In the middle of the oratorio a chorale is sung (Lobet den Herren - "Praise the Lord, for he is kind"), whereas this part is closed with the second stanza of the hymn 'Nun danket alle Gott': "The eternally rich God wishes to give us in our life an always happy heart and noble peace". In the serenata allegorical characters – who often appeared in baroque vocal music - show up. Here they are Einigkeit (Unity), Glückseligkeit (Felicity) and Tapferkeit (Valour). They express feelings of happiness about the prosperity of the city: "Hammonia, you're wonderfully beautiful to me!" (Hammonia is a Latin neologism for Hamburg.) The party is spoilt by a fourth character, Neid (Envy), who gives way to his feelings in a recitative in which he says he would like to see all positive things disappear. "Above all, I'd soon render null and void the most renowned constitution of the colonels and captains". Ironically by describing what he would like to disappear he spells out at length what the citizens of Hamburg have every reason to be proud of. In the end he is forced to join the others in the closing chorus: "To honour your happiness, to protect your unity, to torture envy, to defy the enemy, let the meal of honour often be held, countless times, often, with always increasing number". The Kapitänsmusik of 1744 is somewhat different. In both the oratorio and the serenata the solo voices represent allegorical characters. Hamburgs Schutz-Geist (Hamburg's Guardian Spirit) is the character who connects the two parts of this work. In the oratorio he (scored for soprano) is joined by Die Betrachtung (Contemplation), Die Dankbarkeit (Gratitude), Die Freude (Joy) and Die Freyheit (Liberty) in singing the praise of God for giving peace and urging its citizens to stay close to him. The oratorio closes with a chorale: "He never yet has overlooked a single thing in his government. No, what he does and has done goes on to a good end". The serenata begins with a 'Chorus of the Citizens': "Liberty, liberty! Goddess, you who accompany blessing and peace, goddess, we all hasten to your side, goddess, we all sing of you!" Hamburg's Guardian Spirit leads the songs of praise for the liberty which the citizens of the city enjoy. He is supported by Die Erkenntlichkeit (Discernment), Das Vertrauen (Trust) and Die Lieb zum Vaterlande (Love of the Fatherland). As in the serenata of 1724 there is an opposing character, Der Leichtsinn (Frivolity) who tells the citizens: "You haven't been made free, no! You were born free!". He urges them to care only about themselves, and the thread of the serenata is the opposition between Frivolity and Love of the Fatherland. The latter is presented as the prerequisite for a continuation of Hamburg's liberty. The piece ends with a chorus: "Continue to be, Hamburg, rich in honours and goods, enlightened fathers and watchful protectors, and loyal-minded citizens". These two Kapitänsmusiken contain remarkable music. We hear Telemann at his very best. There are some striking examples of text illustration and of an eloquent use of instruments to express the content of the arias. There are many arias in both works: 10 and 19 respectively, and one is just as good as the other. It is really a feast of singing, also thanks to the excellent interpretations of the soloists. The only non-German speaking soloist is the young Polish soprano Magdalena Podkoscielna, a name new to me. But she is very impressive because of her sweet tone, the flexibility of her voice and her immaculate articulation and pronunciation. I hope to hear more from her soon. Andreas Post has a very clear voice and makes a particular good impression in the role of Neid in the serenata. In Rémy's performance the two basses have quite different voices which makes it easy to tell them apart. Matthias Vieweg has the lighter voice, whereas Ekkehard Abele's voice is darker and stronger. Their voices are well suited to their respective roles of Die Glückseligkeit and Die Tapferkeit. The alto Jörg Erler participates only in the tutti sections. In earlier recordings of Telemann's Kapitänsmusiken the tutti were sung by choirs, but in recent years more and more conductors have come to the conclusion that performances with one voice per part were much more common in the first half of the 18th century than with a real choir in the modern sense of the word. Manfred Cordes uses a somewhat larger ensemble: in the tutti the soloists are joined by three additional singers: alto, tenor and bass. This is inevitable because with three sopranos one needs some extra singers to get the balance right. His soloists are no less impressive than those used by Rémy. Dorothee Mields is often compared to Emma Kirkby because of the lightness, the clarity and the flexibility of her voice. Over the years her voice has become stronger and gained in depth, and as a result has become more dramatic, without losing any of her other qualities. She and Monika Mauch share the role of Hamburgs Schutz-Geist: in the oratorio the role is sung by Ms Mauch, in the serenata by Ms Mields. Both give an excellent account of this crucial role. Ulrike Hofbauer is the naturally most dramatic of the three sopranos, and her performance of the role of Der Lichtsinn is spot-on. I had heard Immo Schröder before, especially in smaller parts in performances of the Netherlands Bach Society. I had hoped to hear him in larger roles, and so I was glad to see him here as one of the soloists. He doesn't disappoint - on the contrary. His singing belongs among the highlights of the recording of the Kapitänsmusik of 1744, not only in his arias but also in the recitatives, which he delivers in a really speech-like manner. So does the bass Dominik Wörner, who has a strong voice, but uses it intelligently and tastefully. All in all there is no fundamental difference between the two recordings as far as the performances are concerned. In Cordes' recording the recitatives are performed with a little more rhythmic freedom than in Rémy's but this is only marginal. Both instrumental ensembles are outstanding. In the Kapitänsmusik of 1744 the orchestra is a bit larger because of the inclusion of two horns and the addition of military instruments, including drums. 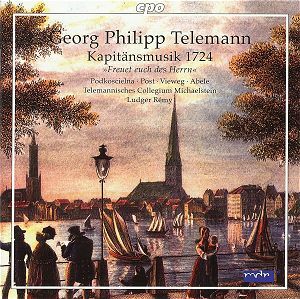 To sum up: this is Telemann at his very best and at his most inspired. It is easy to see why he was held in such high esteem in Hamburg. Ludger Rémy and Manfred Cordes and their respective ensembles clearly were inspired too while performing and recording this music.